But we must not take the survival of the nuclear deal for granted, because it still has many powerful opponents. On January 16, Iran released four US citizens from prison in exchange for the release of seven Iranians who were accused or convicted of sanctions violations. This prisoner swap was possible because the nuclear deal has made the privileging of diplomacy over threats and war a key component of US-Iranian relations. The same is true of the quick release of two US Navy patrol boats and 10 sailors who strayed into—or perhaps deliberately entered—Iran’s territorial waters a week earlier. The prisoner exchange was announced just as US Secretary of State John Kerry and Iranian Foreign Minister Javad Zarif began discussions in Vienna on implementation of the nuclear deal. Following the findings of the International Atomic Energy Agency, the United Nations’ nuclear watchdog, that Iran had fulfilled its obligations under the deal to vastly reduce its uranium-enrichment capacity and dismantle its sole heavy-water reactor, the related international sanctions that have so crippled Iran’s economy will now be terminated. Of the four US citizens released—all of them dual Iranian citizens as well—the best-known was Washington Post Tehran bureau chief Jason Rezaian, who had been imprisoned for 18 months on espionage and related charges following a series of mostly undisclosed court processes. The others were Saeed Abedini, a Christian pastor assumed to have been arrested for proselytizing; Nosratollah Khosravi-Roodsari, about whom little is known; and Amir Mirza Hekmati, a former US Marine who was arrested in August 2011 while visiting relatives in Iran and charged with spying for the CIA. A fifth American, a student arrested in Iran, was released as well, though not as part of the exchange. In addition to the release of seven Iranians, the United States agreed to stop pursuing Interpol warrants against 14 Iranians “for whom it was assessed that extradition requests were unlikely to be successful,” according to one US official. The prisoner exchange and the release of the US war boats provide an important model for the kind of diplomatic engagement that the Iran nuclear deal makes possible. While the deal was negotiated between Iran and the so-called P5+1 nations (referring to the five permanent members of the UN Security Council plus Germany), the core of the negotiations was aimed at ending decades of US-Iranian hostility. The deal on its face was quite narrow; otherwise, it likely would never have been achieved. It imposed vast limits on Iran’s nuclear-power program in return for lifting international economic sanctions. As we know, even that narrow agreement almost failed because of opposition from those who preferred war over diplomacy—in Israel, in the US Congress (mostly from Republican members, but certainly not only them), and from the hard-liners in Iran’s Parliament. The broadening of the agreement as the basis for greater normalization between the United States and Iran remains a challenge for peace activists and for all those who support diplomacy as the foundation of US foreign policy instead of threats of war. Such an expansion of US-Iranian diplomacy provides not only the long-term possibility of a “grand bargain” between Tehran and Washington, but also the more immediate potential for hastening an end to the catastrophic Syrian war. However, even the survival of the existing nuclear agreement cannot be taken for granted. The Obama administration’s unilateral imposition of new missile-related sanctions against a few Iranian individuals and businesses, while not likely to have much of an impact on the Iranian economy overall, is a good indication of the potential political dangers facing the nuclear deal. It will have to be defended against opponents in Congress, in Israel and among Israel’s US supporters, and in neoconservative and militarist-oriented think tanks and media outlets. Its opponents also include powerful political actors, including candidates for president—all of which means that the extraordinary mobilization of progressive forces that came together to defend the agreement last year must be prepared to enter the fray again as the agreement comes under attack. But the nuclear deal did represent the victory of diplomacy over war. And despite its naysayers, the deal has not only massively decreased Iran’s nuclear-enrichment capacity and ended the international sanctions; it also holds out the possibility of a far broader improvement in US-Iranian relations, having set the stage for the prisoner exchange and the quick release of US war boats and sailors. So now, even though human-rights and humanitarian issues were never officially included in the negotiations, we’re seeing how the easing of tensions between the two nations that the nuclear deal has made possible is already bearing fruit in those areas. 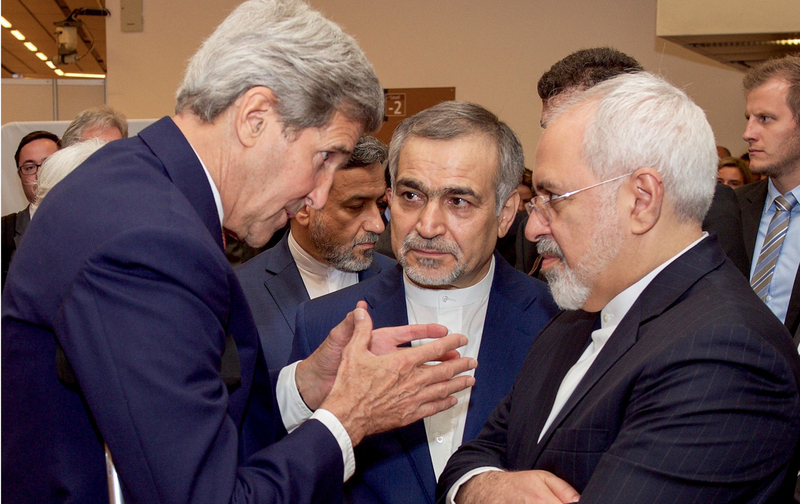 Defending the nuclear agreement—and demanding that it be expanded—will be a lot easier this time around. We’ve got the evidence that it works.